I recently did a post on sunflowers with some great pictures. I grow sunflowers for attracting beneficial insects, feeding birds and because they are beautiful. But there is something else you can do with them—you can roast the seeds from the heads after the flowers fade and EAT THEM! The biggest sunflowers like Titan, Kong, Giant Gray Stripe and Mammoth which produce big seeds are best. Cut the heads off when the plants are starting to fade and the sunflowers plant yellows. Then let the heads finish drying till they are brown and dry but move them inside as the birds will start to eat the seeds if they find the heads. The smallest flower heads I leave out around the garden for the birds to get the seeds. 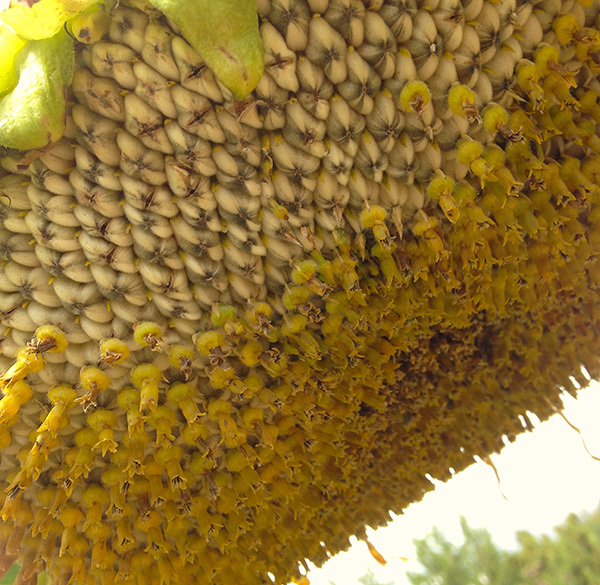 After the big flower heads are dried, rub off the front of the flower head to reveal the tightly packed sunflower seeds. Using your thumb, start to rub from the edges and the seeds will release and continue till you get most of them. I do this outside as it is a bit messy with dried parts everywhere. I just sit at my outside patio table to do this. Clean out the dried flower parts from all your seeds before the next step. Preheat the oven to 300 degrees Fahrenheit. Spread the sunflower seeds evenly on a cookie sheet or in a shallow pan, and bake for 30 to 40 minutes or until golden brown, stirring occasionally. The seeds often develop a small crack down the center as they roast. Taste after each stirring to see if the seeds are completely roasted. After roasting, remove seeds from the oven and allow them to cool completely. Store the seeds in an airtight container for future snacking. YUM! !